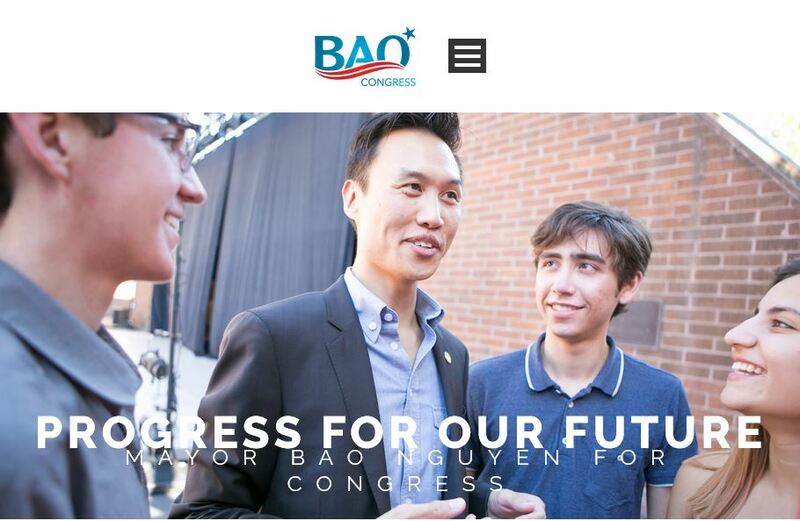 I’m Bao Nguyen, Mayor of the City of Garden Grove. I’d like to share with you why I’m running to represent California’s 46th District in the House of Representatives of the U.S. Congress. I was born in a refugee camp and came to the United States when I was three months of age. I am a proud product of public schools in the cities of Anaheim, Orange and Garden Grove. I earned a bachelors degree in political science from UC Irvine and a masters in religious studies from Naropa University in Boulder, Colorado. Thereafter, I worked as a substitute teacher and became a community organizer for our local churches. I helped to organize senior citizens in Garden Grove to establish a senior transportation program in the city. I believe in people because I know that when we come together to create positive change in our communities, we can win. I often reflect on my parents’ journey and it is hard for me to imagine the risks they’ve taken to escape an oppressive government and sacrifice everything for a better future. I am grateful to my parents and I want to honor their sacrifices by fighting to make sure that as Americans we have a government that serves the interest of the people. During the time I served on the school board, I worked to invest funding to modernize our schools, to improve educational opportunities for our students, and to fight against bullying and discrimination. As an elected city mayor, I fought to maintain local control of our water resources, going against the big corporate interests trying to charge county residents more for less water while destroying our environment. I have worked to help small business owners and local entrepreneurs by partnering with Google. But my greatest achievement was implementing measures to increase transparency and accountability of our local government. Now, I’m asking for you to join me in making sure that our voice is heard in Congress. I need your support to fight for a federal government that serves the people. Please vote for me in the June 7, 2016 Primary Election and lend me your support. Now don't you want to see him in Congress?